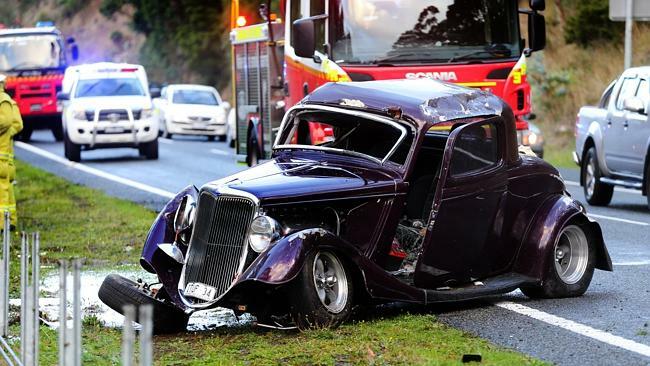 A VICTORIAN couple ended up in hospital when their hot Rod rolled over on Hobart’s Southern Outlet yesterday. The crash happened about 4.30pm as the couple were heading into Hobart, south of the Olinda Grove turn-off at Mt Nelson. They were in Tasmania for the weekend’s Australian Street Rod Federation event at the Hobart Showgrounds, which attracted more than 370 vehicle entries. Organiser Lindsay Greenwood said he understood the man had suffered broken ribs and the woman, who was the driver, suffered facial injuries. Mr Greenwood said dozens of people had come from interstate for the event, including about 60 from Western Australia, and many had spent a few weeks touring the state. Police said it was unclear what caused the crash, but the road may have been wet at the time. What a shame, I used to live in that part of the world and worked at a Rod shop, we used to attend this show all the time, these cars are so well built as the laws are probably the toughest in the globe and maybe this saved the people lives as the construction was done well, but unclear why it happened. But its gut wrenching when a vehicle that has had thousands of painstaking hours put into, ends like this, I sure hope everyone is ok? A sad blog but wanted to post this today as things happen. Safe recovery and hope people can help get this machine back to its show winning condition. This entry was posted in Blog and tagged coupe, cras, custom car, drla, hot rod, nhra, vhra, victorian hot rod show.